Tamir Hargana of DeKalb, 25, performs a unique form of music called Tuvan Throat Singing, also known as Mongolian Throat Singing, on Tuesday, Nov. 29, 2016 at Oak Crest in Sycamore. Hargana is from Mongolia and is able to study at NIU thanks to a scholarship from Oak Crest resident Lester Smith. 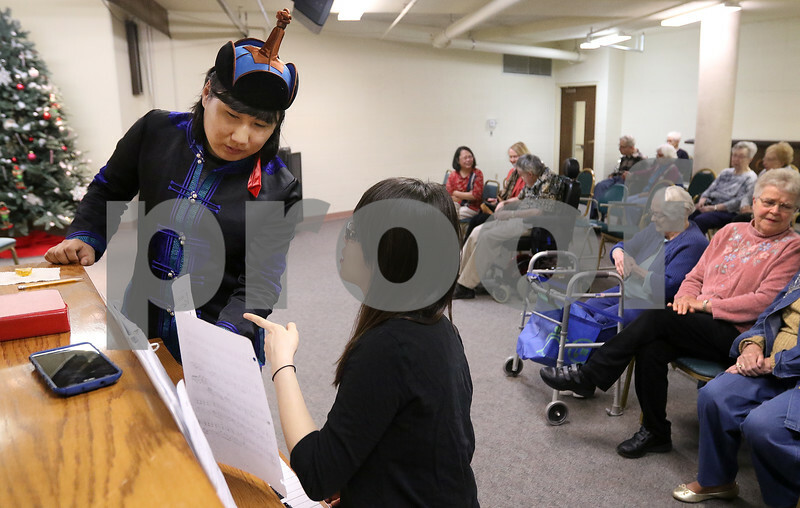 Tamir Hargana, 25, left, talks with Pei Han Lin, 26, both of DeKalb, as they warm up for a unique musical performance called Tuvan Throat Singing, also known as Mongolian Throat Singing, on Tuesday, Nov. 29, 2016 at Oak Crest in Sycamore. Hargana is from Mongolia and is able to study at NIU thanks to a scholarship from Oak Crest resident Lester Smith.